I first heard of a negroni in chef Gabriel Hamilton's food memoir Blood, Bones, and Butter (a great summer read, if you're looking for one!). She speaks so lovingly of them, and so delicately describes sipping on one at the edge of an Italian olive grove during a summer sunset, that it left me as eager for a negroni as for a Tuscan vacation. I was craving one before I even knew what it tasted like. Very excited about this new perfect cocktail, I ordered one at a restaurant near me, excitedly brought the cup to my lips and thought....gross! A negroni is an acquired taste. On first sip, it can be jarringly bitter and bizarre. But subsequent sips, as the ice melts in and the flavors meld, reveal something complex and bright and totally addictive. In other words, this is a grown up cocktail. It's meant to be gently sipped, pulled slowly through your teeth and left to linger on your tongue, not guzzled like a watery wine spritzer (although there's a time for guzzling wine spritzers, don't get me wrong!). Sipping a negroni makes you slow down as if you're enjoying a Tuscan sunset of your own. The most important thing to know about making one is that it is perfectly simple - it's best when you don't muck around with the recipe or the proportions. As Hamilton has said "the Italians are perfect in their restraint." A classic negroni is made up of equal parts gin, Campari, and sweet vermouth. It's super simple, but exact. This is not a time to make like Tom Cruise in Cocktail, flinging bottles about and eyeballing your pour. Mine come out best when I measure each pour with a shot glass. Buttttt....I'll admit, I've rebelled. When I ordered a negroni at Le Bernardin in NYC, the bartender passed over the Campari and pulled out a charmingly mysterious bottle instead. It's Gran Classico bitters, which is actually Swiss, but works well "in the Italian style," as they say in their website. As far as I can tell, the taste is somewhat mellower than Campari, although very similar. I'll be honest with you, it's a love affair of the eyes. I know you're not supposed to judge a spirit by its cover, but...how cool is that label?! What a cocktail made with Gran Classico lacks is the candy-red hue that Campari lends. But I can't resist a bottle of this "Tempus Fugit" spirit on my bar. They are equally delicious, so use whichever you have on hand. Either way, the rule's the same: measure, measure, measure. This is the part that will make you feel like a trendy Brooklyn mixologist: while you peel the orange for the garnish, hold it over the glass, so the spray of oils falls into the glass. The orange rind-y flavor is an important part of the drink to me, so I give the peel a little rub on the side of the glass as well before dropping it in the brink. Then give the drink a good stir - this is one cocktail that improves when the ice melts into it a bit. 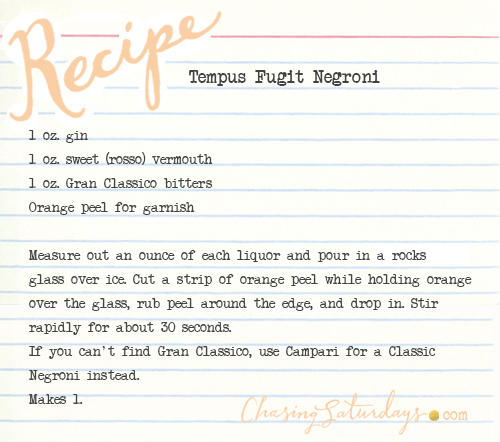 I call mine a Tempus Fugit Negroni as a nod to that ridiculously cute label, but you can keep it classic by sticking with Campari, and you'll be just as happy. Either way, be sure to imagine yourself in Italy as you sip away.